Elephants and rhinos move closer to vanishing forever. Join the Global March ATX in solidarity with thousands around the world to MARCH AGAINST EXTINCTION. Help The Global March save and protect Africa's top keystone species from the illegal wildlife trade by donating to our CITES (Convention on International Trade in Endangered Species of Wild Fauna and Flora) Fund to send Team Members to the 2019 International 2019 Meeting in Sri Lanka. Global March organizers plan for CITES 2019 in sri Lanka. 2018: VUKA GATHER VENUES, TRADER JOES, TITOS HANDMADE VODKA, THIRSTY PLANET, WILDERNESS SAFARIS, CAPITAL PRINTING COMPANY, TESOROS TRADING COMPANY, ZUCCHINI KILLS, PREMIER RENTALS, BOMBAY DHABA. 2016-17: Capital Printing Company, ImageCraft Exhibits, Lisa Hoffner, WildEye Photography, Violet Crown Cinema, Tesoros Trading Company, Tejas Sound, Reggie Mahadeo, Farmers Insurance, Sheila Westerholm Smith Insurance, Afro Caribbean Soul Collective and BumperActive Tees and Stickers. the march helps fund such charities as The David sheldrick wildlife trust to save elephant calves abandoned due to poaching. A local 501(c)(3) Non-Profit, The Global March for Elephants & Rhinos ATX raises awareness of threats to wildlife and funds to support top rated conservation organizations working to save threatened species and secure their future. Marching in solidarity with over 140 cities worldwide, The Global March ATX takes action every year locally to change laws and policy globally to prevent species vanishing into extinction. Inspired by the first Kenyans United Against Poaching and The David Sheldrick Wildlife Trust's iWorry marches in 2013, the Global March has evolved into the world's most powerful grass roots movement to save endangered species. 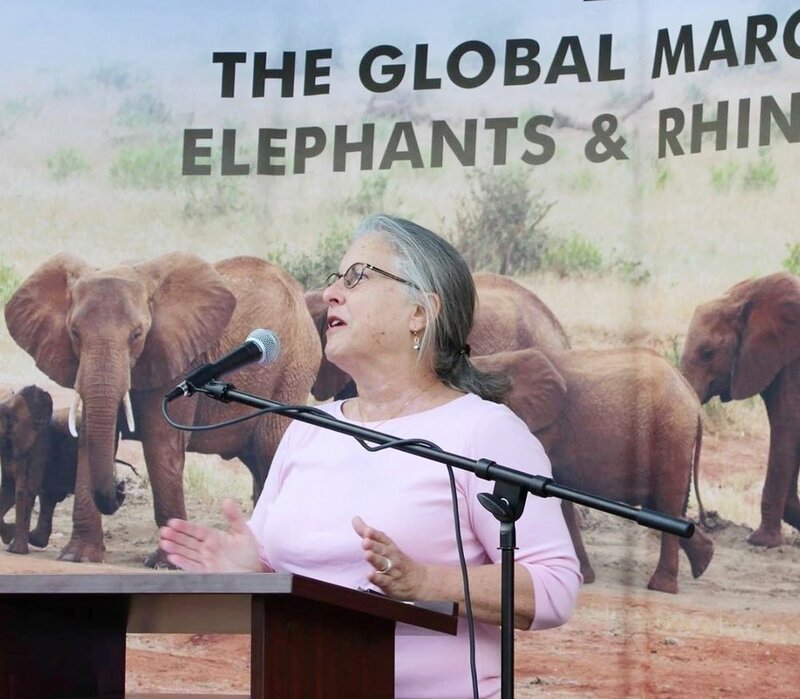 The March provides people from across the globe information and tools to come together as ONE VOICE to demand action for protection of elephants, rhinos and other critically threatened wildlife. For more information, please see Global March News page from cities around the globe and our Toolbox page and Press Release. Austin locals marcH in solidarity with the global March for elephants and rhinos INTERNATIONAL in over 140 CITIES WORLDWIDE. Austinites have marched in solidarity with cities around the world including the 2016 opening day of CITES (Convention on the International Trade in Endangered Species of Wild Flora and Fauna) in Johannesburg, South Africa. In partnership with the international march and 140 cities around the world, the Global March ATX helped influence CITES VOTE which Approved: 1) listing all pangolin species on Appendix I, ending the trade; 2) decisions to stop the illegal cheetah trade 3) a mechanism to look into trade in African wild dogs 4) protection for imperiled Barbary macaques 5) listing African grey parrots on Appendix I to end pet trade 6) a ban on commercial trade in wild lion bones, skeletons, claws and required South Africa to set a quota for trade from canned hunt facilities. And working with our Global Partner, we helped achieve one of our top goals: The U.S., China and Hong Kong will shut down their ivory trade! But we must continue to save elephants and rhinos from ongoing poaching! Speaker City council member leslie pool reads the City of Austin Proclamation honoring the work of the global march atx to save species. Help us raise awareness and support the best charities working on the front lines to save species through our Wild in Crisis Intervention Fund. Some of our most iconic species are on the brink of extinction. Elephants and rhinos are being poached across Africa and we may lose them in only 10 years. Desert and forest elephants may disappear in as little as 24 to 36 months! Orangutans are losing habitat and their lives to Palm Oil plantations in Asia, the same companies which now threaten wildlife in South America and Africa. It is critical for the international community to come together to stop governmental corruption, bad governance, wildlife crime and demand for ivory, rhino horn and other wildlife parts and put an end to the slaughter of wildlife. Please help us take effective action now so we don't lose anymore species on our watch. Let's work to secure a future for all species! Visit Take Action and Toolbox pages for info and valuable tools. Download Press Release.